Welcome to my weekly series: Book Club Picks. This week I have a guest post from Sue at Book by Book. 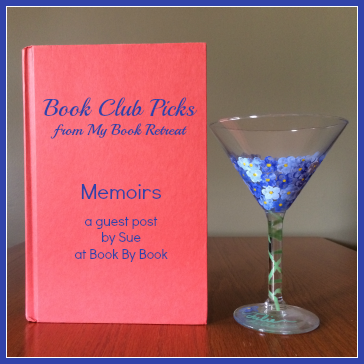 Sue is here to share some recommendations on memoirs that she has enjoyed discussing with her book clubs over the years. Surprisingly enough, I haven't read a single book on her list, so I'm very excited to share all of these new-to-me book recommendations! The author grew up in the 1950’s in Niagara Falls, NY, and was “prescribed” by her pediatrician to help her father in his pharmacy business at just 3 years old – a fascinating, warm, and hilarious memoir of childhood that my neighborhood book group loved. Our library group found plenty to discuss in this unique memoir about a boy growing up in foster care and the unbreakable bond between a mother and child. The first of three memoirs written by the author when he was in his 90’s (!) tells the story of Harry’s earliest years growing up on a cobblestoned street in England where Jewish families lived on one side of the street and Christian families on the other. Topics like alcoholism, abuse, prejudice, and love provide plenty of fodder for in-depth discussion. Long before transgendered people became big news in pop culture, Jennifer wrote this warm, touching, funny memoir about her experiences living as a male when she knew she was female, including being a husband and father to two children and her transition to becoming a woman. We read this for LGBT History Month (October). An entertaining, educational, and enriching memoir about the author’s childhood in Liberia which delves into both her personal coming-of-age story and Liberia’s unique history (something I never learned about in Social Studies class!) and devastating outbreak of war. If your book group is willing to try something completely different, Bechdel’s graphic memoir (like a graphic novel, with cartoon-like pictures and text; Bechdel’s drawings are very realistic) is engrossing, insightful, and unique, about her relationship with her gay dad and her unusual childhood, with plenty of topics for discussion. Sue Jackson is a freelance writer who lives in Delaware with her husband and two sons. She writes a blog about books, featuring reviews, book news, and more at bookbybook.blogspot.com. You can find reviews of the books listed here on the blog, as well as her Big Book Summer Challenge, which just started. I love that my book club makes me pick and read books I wouldn't normally choose on my own! Great list! My book group read Fun Home and it spurred the longest discussion we'd ever had. its going to be a Broadway play. Read Fun Home and then see the play! !